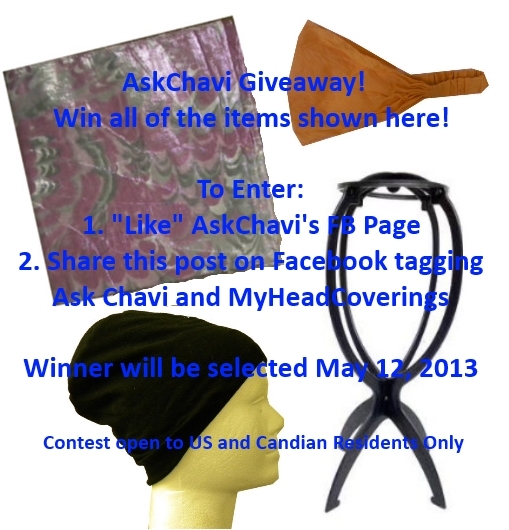 AskChavi in conjunction with MyHeadCoverings.com is giving away four items to one lucky winner. The items are shown in detail in the video below. MyHeadCoverings.com sells a wide variety of hair coverings including hats, tichels, scarves,snoods, turbans, berets, headbands, wig accessories and more! Check out their website for all of your headcovering needs!! 2. Share Giveaway Image on Facebook! Tag AskChavi and MyHeadCoverings on Facebook when you share the status!! 3. Enter by 5/12/2013 (end of day) to be considered!!! I will ship to US and Canada free of charge! These are just a few examples of the wide variety of items they carry.